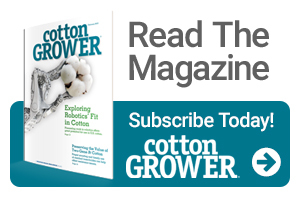 The Cotton Board’s annual Calendar Contest is underway, as they seek one great cotton photo to be selected and featured in the organization’s 2019 Industry Calendar. To be eligible to win, contestants must first “like” The Cotton Board Facebook page, then email their high-res jpeg photo to sgorman@cottonboard.org. Up to three entries per contestant will be considered. The contest ends on October 5, 2018. Cotton Board staff will vote to determine the winning photo. The contest winner will have their photo – along with photo credit – featured in the 2019 calendar and will also receive a cotton prize pack, including 25 copies of the calendar to share with friends and family, plus other cotton prizes. Published each year, The Cotton Board calendar is mailed to every cotton producer and ginner in the U.S.